Bad: Combat seems awefully simple and unfair at times. Every now and then, somebody decides that it’s time to get out the old consoles from the back of their closet once more, to fire up that one classic they used to love. Sometimes, developers decide it’s time to create something that feels like every game back in the day to keep the same nostalgia alive. And then you still have games like Coffee Crisis, where developer Mega Cat Studios actually released the game for the original Sega Genesis. Or you can play it on Steam, PS4 and Xbox One of course. Nick and Ashley are two alternative-looking baristas with a great love for coffee. AND THEN THE ALIENS INVADED. Yes, this has to be written in all caps, cause that’s where the game starts. You just get thrown into the middle of an alien invasion while your chosen character was working. There is no explanation, only fights, and the first thing you try to do is smash some buttons to see which button does what. After that, a small introduction of the ultimate baddy, an alien general, will follow and you’ll get some instructions about the controls and how to use them. From that moment on you follow a weird little story about how two simple tough-as-nails baristas try to save the world and travel to the weirdest locations held possible. For those who actually actively experienced the Sega and Super Nintendo years, a lot of these graphics might spark some memories. The animations as well as the colorful environments, even though they are in high definition this time, could have easily been created 25 years ago, so they fit nicely into the void they are meant to fill. 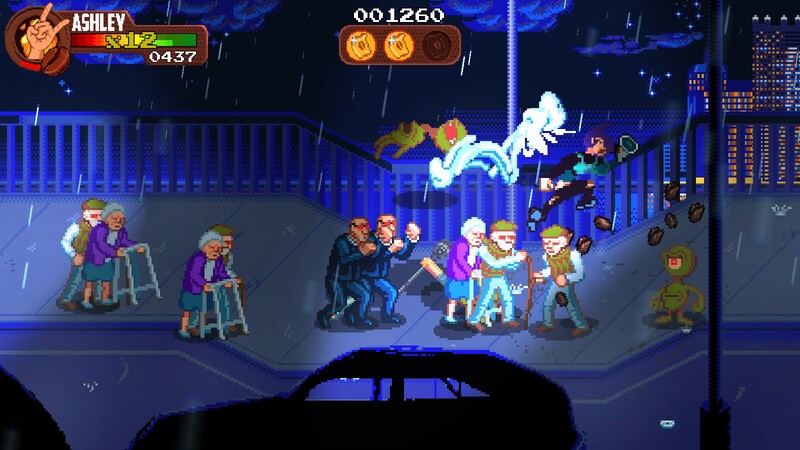 This includes the wacky absurdness such as animated elderly people enemies who come to smash your head in with their walking racks. On a note of confusion: there are random filters thrown into each level as a rogue element. They don’t really add anything and seem oddly out of place, even as a quirky element. So some weirdness is just.. there without reason, and you have to accept it. What music do hipster baristas like? Ruaaah! Metal! It’s the theme song, it’s during your playtime, it’s everywhere. And it fits. 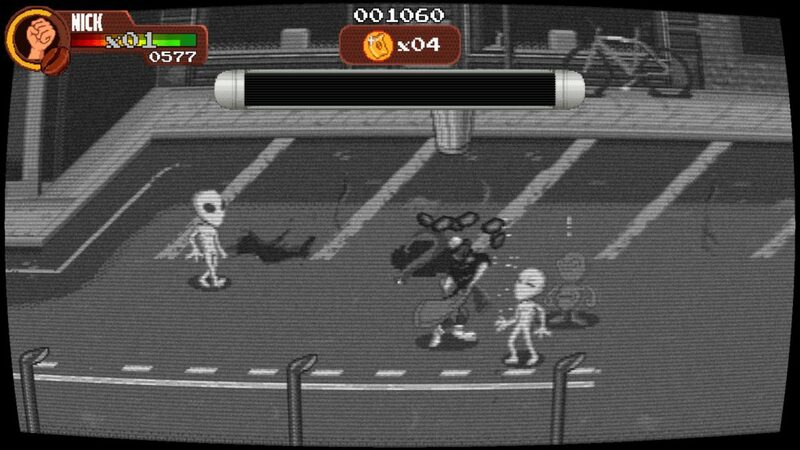 Apparently, smacking aliens in the face with coffee bean bags is not doable without the heavy necessary music. But it feels good and combined with the sound effects you have a nice little combination. Cracking and smacking in retro style sounds good but feels better. Worth to mention is the unexpected pause music as well, where the menu pops up together with elevator music, allowing you a break in style. 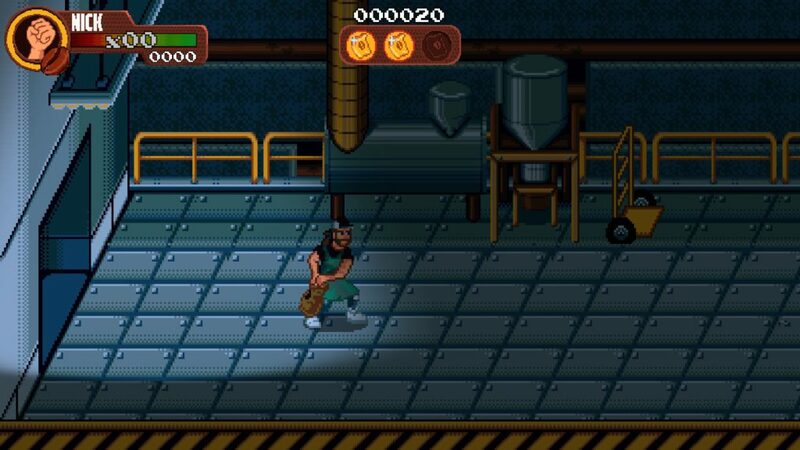 Coffee Crisis is a side-scrolling beat ‘m up adventure, with many arcade elements. Essentially, you got four buttons you can use while walking around. A normal attack, which you will use the most, a jump that you barely or don’t need to use, a button to pick up items or grab enemies so you can throw them away, and a special attack. The special attack, as is the tradition in this genre of games, uses some of your coffee-meter which are your health points as well in this game. The special attack doesn’t feel much different than the normal ones, except when playing with the Nick character it’s tempting to use it, since you will whirlwind, smashing enemies away all around you. Keep in mind that you might suddenly be out of health points by overusing it, leaving you very vulnerable. During your fights, items such as extra damage or invincibility will drop out of environmental objects or defeated enemies. These items, combined with rogue filters and fighting events (the latter don’t have much variation), give a little bit of an extra edge to the game, but not much. The standard in these types of games is also that you fight your way from scene to scene, mostly indicated by an arrow when the fight is over. In Coffee Crisis, half the time you can walk past enemies to the next obligatory part where sometimes something rogue will appear. It’s slightly refreshing to have a small amount of freedom included in these games by actually just being allowed to walk past certain things. Besides these gameplay points, however, there is not much else to do. You can pick up a mini game among other drops, but it’s simply smashing your keyboard trying to gain an extra life. And it requires a lot of smashing, so maybe that one life isn’t worth a new keyboard. Because of the limited fighting capabilities of your characters and the little variation in the gameplay itself, the game’s strength lies in short sessions where you are longing for nostalgia, metal, and quirkiness. Enjoy the scenery everything retro about the game first, the battles second. Even though it doesn’t have much variation and it takes some getting used to, Coffee Crisis actually is a rather nice game if you want to play something simple or have a game for a couch co-op moment. It’s filled with retro graphics, good sounds, and proper hit-and-get-hit feelings. It’s wacky and rather unique which is its biggest selling point, but the gameplay is a bit lacking, even for a simple arcade beat ‘m up game. Nevertheless, a modern retro project that worked out fine for what it is.